This is also a great time to review Concert Etiquette and the Dress Code. Mr. McCarthy has been talking to students about UMass Band Day. On October 24, Nashoba Band students will travel to Gillettee Stadium and perform on the field at halftime with the UMass Marching Band. This trip is open to all Concert and Jazz Band students. Permission slips are due September 30. 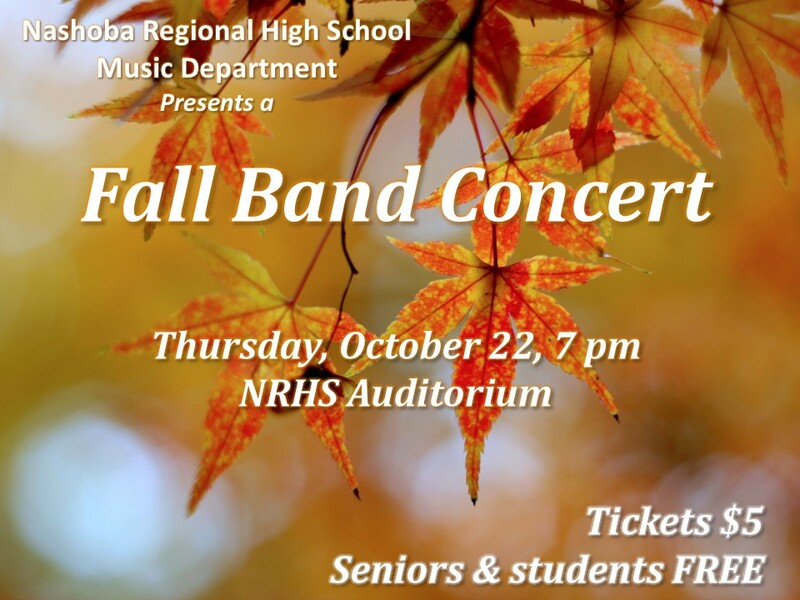 Can’t get enough of Nashoba Bands and Nashoba Choirs? Visit the class websites and follow us on Twitter! I want to send a huge thank you on behalf of myself and Friends of Music to all of our families and students who helped make our annual car wash on Saturday a huge success. At some points, we were washing 4 cars at a time! With the help of our very enthusiastic students who washed the cars, held signs, helped move equipment, and helped sell our baked goods, we raised just over $540 that will all get divvied up between all of the students who helped work on Saturday. The money will get broken down into an hourly wage which will go into a student account that is managed by our Friends of Music. This money can be used by your students to help subsidize any of the costs of the music events that we do. This could be used to help pay for central districts/all state, various professional concerts we attend, annual field trips, or really anything that we do as a music department. The Friends of Music Car Wash will be Saturday, September 19th from 9 am – 2 pm. All students who work the event earn money which they can use toward the costs of things like concert field trips, Central District fees, and choir dress costs. Students can sign up with Mr. McCarthy or Ms. Pelchat this week at school. We’re asking if parents could please donate baked goods which we will sell at the car wash. Items can be dropped off between 8:45 am and 9 am on Saturday morning. Folks who would like to arrange to drop items off on Friday can contact Paula at nrhsfriendsofmusic@gmail.com to make arrangements. Welcome back! I hope your first week back was as stress free as possible. AFTER SCHOOL FIRST REHEARSAL: Tuesday, September 8, 2015. Concert choir (which meets during the day) has really hit the ground running! I am so excited to hear our Mixed Chamber Choir and our Broadway Women’s Ensemble. Attached you will find a welcome letter where I introduce myself and tell you a little bit about this year. You will also find the guidelines and expectations for our choirs. PLEASE REVIEW THESE POLICIES, SIGN THE CONTRACT, AND BRING IT TO ME ASAP. This will be for the first 5 points for students’ grades. However, I will accept contracts as late as TUESDAY, SEPTEMBER 15. During rehearsal, we will go over guidelines again and I will hand out information regarding concert attire. The concert attire will be the same as last year. If you have any questions or concerns, feel free to contact me! I check my email several times during the day and we can figure out ways to make this work for your family. PLUG: Friends of Music is our parent group that helps to fund all of our incredible music department activities. In the past we have taken trips to New York City, seen Boston Pops concerts, and participated in numerous festivals. I encourage parents to join so that students can have as many opportunities through this music department as possible during their time at NRHS! I am looking forward to meeting singers on Tuesday and, hopefully, parents at open house night on the 24th @ 6pm.